Background: Due to increased use of antimicrobials, pathogenic bacteria have pioneered their own intrinsic resistance for antibiotics that raise the demand of inventing new antimicrobial agents. These pathogens possessed a bunch of cell transporters which confers resistance to antimicrobial agents known as efflux pump. 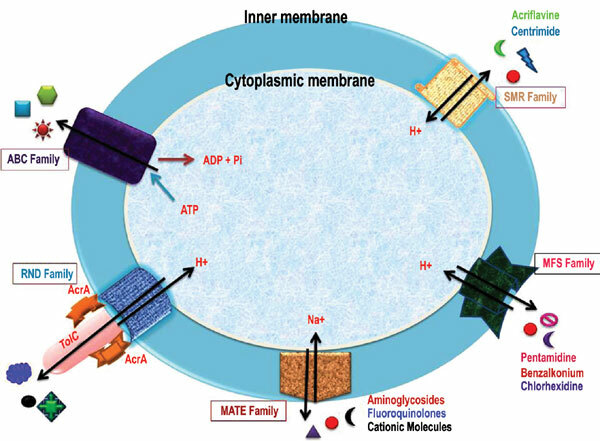 Five major classes of efflux pumps are resistance nodulation and cell division (RND), small multidrug resistance (SMR), multidrug and toxin extrusion (MATE), major facilitator superfamily (MFS) and ATP binding cassette (ABC). Objective: The authors reviewed different class of efflux pump inhibitors which includes Lphenylalanyl- L-arginyl-β-naphthylamide (PAβN), arylpiperidines and arypiperazines, nocardamines, arylated benzothiophenes and tiophenes, carbonyl cyanide mchlorophenylhydrazone (CCCP), sodium orthovanadate and phenothiazines based on their substrate specificity. Methods & Result: The authors documented the role of efflux pump inhibitor based on their activity upon specific class of efflux pump. The efflux pump inhibitor hinder the efflux pump activity by binding to the receptor, blocking the transport of the drug molecule, by changing protein structure or by reducing the energy involved into pump function. Conclusion: The structure studies assist to design new drug compound which can efficiently inhibit the efflux pump and provide promising efflux pump inhibitor to cure multidrug resistance caused by the bacterial community. 3D structure of the efflux pump reveals the drug binding site and drug dislodgement site. The efflux pump inhibitor reduces the necessity of discovering novel drug molecules and provides a new way to reutilize existing drug with slight modifications. Bacteria, efflux pump inhibitor, inhibition mechanism, antibiotic resistance, drug discovery, pathogenic strains.